Undoubtedly one of the best folk duo combinations... Coming to Vancouver this Fall!! 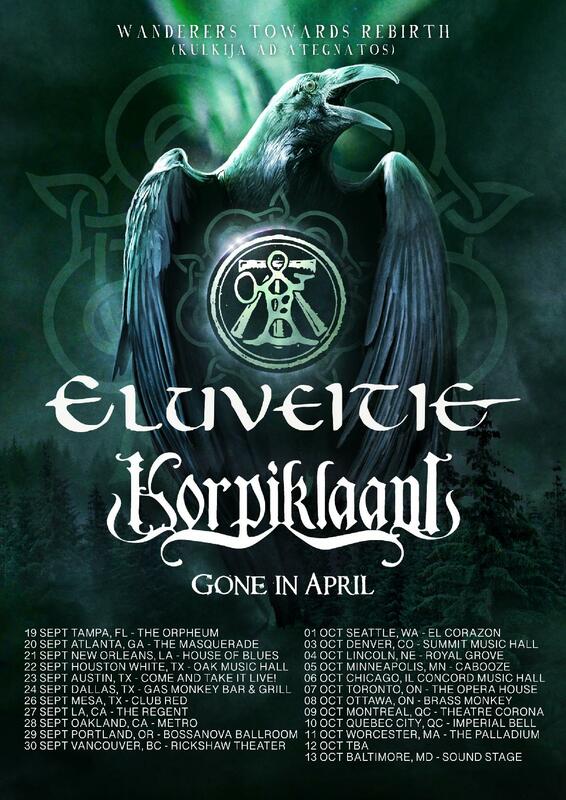 ELUVEITIE will finally be returning after 4 years of absence. The 9-people Swiss act will release their first Metal album in 5 years, “Antegnatos”, to be released this Spring via Nuclear Blast Records. Different chart positions and several tours later (supporting the likes of Wintersun, Amon Amarth, Epica, etc), along with several headlining tours, the band is ready to come back and support the new album with a complete set. Finland’s folk masters KORPIKLAANI will be coming back our way by popular demand, after last year’s highly successful tour w/ Arkona. The band needs no further introduction as the most legitimate leaders in the genre. After headlining and co-headlining all their North American tours (thus sharing stages with Ensiferum, Turisas and many others), Korpiklaani will be carry on the promotional campaign for “Kuljika”, released last Fall through Nuclear Blast Records.